Littlehampton Town Football Club let a two-goal cushion slip in the final 13 minutes as they went down 3-2 at home to rivals Chichester City in their Southern Combination League Premier Division clash last night. A first half strike from Ben Gray and Jack Cole’s maiden Golds goal on the hour looked to be enough to hand Ady Baker a first win as boss. But credit to City, after Jamie Horncastle’s header 13 minutes from time gave them a lifeline they took full advantage. In-form striker Scott Jones and Ellis Martin found the net in the final ten minutes to ensure City foughtback to take an unlikely three points. After a promising start, Golds took a deserved lead on 20 minutes when Gray found the target. 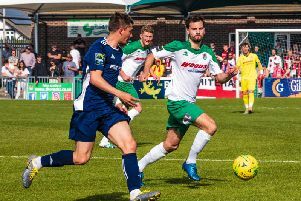 An improved performance from Baker’s side saw them double their lead with an hour played as forward Cole notched his first-ever Littlehampton goal. Golds were in cruise control and a first three points for Baker looked certain but Horncastle gave City hope when he headed home from a corner. The prolific Jones then levelled things up with seven minutes left to play, before a wonder strike from Martin broke Littlehampton hearts and helped City to a 3-2 success. Littlehampton boss Baker said: “For 75 minutes we played them off the park and should have been four or five up. Golds travel to fellow Premier Division side Worthing United for a Peter Bentley Cup second-round tie on Saturday. LITTLEHAMPTON: Hutchings; Peters, McKay, Bates, Ball; Janman, Hand; O’Connor, Kew, Gray; Cole. Subs: Chaplin, Farrell, Curnow, Darwin, Askew.